Saint Martin is one of the many islands in the Caribbean, and if you like the beach, then this is the place to be. Saint Martin is world renowned for its beach resorts, and nothing screams relaxation better than one of those luxury beach resorts where you lay in the sand all day long enjoying excellent food and delicious beverages. The island is big enough to allow some exploring as well, but do not get your hopes up. The highest point in Saint Martin is Pic Paradis, but it only has 424 meters in height. Before you plan your trip to Saint Martin, there are a few things you should know about the place. The first thing that is worth mentioning is that Saint Martin is a 2-in-1 kind of a deal. Why is that? It is because the island of Saint Martin is split in two. One half is French and is called Saint Martin, and the other is part of the Netherlands, and it is known as Sint Maarten. 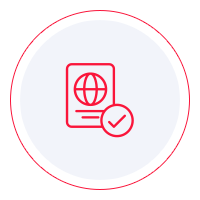 This is important to know because depending on which side you want to visit, you need to do some research about the visa requirements. After all, we are talking about two separate states with different visa policies. As far as the French part of Saint Martin is concerned, we need to take a look at the visa policy of the French overseas territories. Fortunately for most of you, the visa policy is lenient, and almost anyone can get on the French part of the island. As any other visa policy, this one includes a list of visa-exempt nationalities. It is just the allowed period of stay that differs. The factor that makes the difference is the nationality. For example, if you are a German citizen, you can enter and stay in Saint Martin indefinitely because your country of origin is a member of the European Union. Besides EU countries, the citizens of Andorra, Iceland, Liechtenstein, Monaco, Norway, San Marino, and Switzerland are also allowed to stay in Saint Martin for an unlimited period. The visa policy also contains a list of countries whose citizens can stay in Saint Martin for periods that vary from 3 to 6 months, depending on the nationality. Before you start planning your trip to Saint Martin, you need to consult the visa policy of French overseas territories to see where you stand. In the event that you do not find your country on neither of the lists, you must go to the nearest French embassy and apply for a visa for Saint Martin. Another aspect of note is that a Schengen visa will not grant you entry in Saint Martin. While France is a part of the Schengen Area Agreement, Saint Martin is not. As a result, you need to submit an application for a Saint Martin visa. The official language in the French part of Saint Martin is, of course, French. However, the location is very well versed as far as tourism is concerned, and you will be able to communicate in English. Getting to Saint Martin is reasonably easy. You will land at Princess Juliana International Airport. It may be on the Dutch side of the island, but you can take a flight to the French side if you wish. When it comes to what you can do in Saint Martin, the options are various. Of course, you can enjoy the beach all day long and do other beach-related activities, but there are other attractions as well. For one thing, you cannot go to Saint Martin and not visit the Butterfly Farm. The place is swarming with hundreds of species of butterflies. It is a gorgeous sight. As food and drinks are concerned, let’s not forget that this is the French we are talking about. There are about 300 restaurants on the island, but some of them are on the Dutch part. However, the French will delight you with fine cuisine and excellent wine. All in all, Saint Martin is a beautiful Caribbean location that will help you forget about your day-to-day life. You can relax, bathe in the Ocean, see the butterflies, gamble in one of the many casinos, or explore the parts of the island. The location will not disappoint, and you will get home more relaxed than ever.